The adage that the Old Testament conceals the New Testament and the New Testament reveals the Old Testament is demonstrated numerous times throughout scripture. When studying the Old Testament, it is clearly understood only by viewing it with a New Testament perspective. In the same way, Jesus hides his wisdom in parables; the Old Testament obscures a more complete understanding of Jesus. It is the New Testament in which we can view Jesus with clarity. Another extraordinary incident occurs in the book of Jonah. Jonah 1:17 states that Jonah was in the belly of a fish (representative of Sheol, or the grave), for three days and three nights. Jesus explains this type when he asserts, “For just as Jonah was three days and three nights in the belly of the great fish, so will the Son of Man be three days and three nights in the heart of the earth. (Matthew 12:40) Jonah emerged from the fish just as Jesus rose from the grave. With the understanding learned in the New Testament, it is clear that this chapter is about the crucifixion of Christ. As a matter of fact, it would be easy to assume that Isaiah 53 has New Testament roots. Written 700 years before Christ, this prophesy hides truth in plain sight. Only after the cross can one clearly understand the meaning. These are only three illustrations tucked away in the Old Testament that are deciphered through the New Testament. If anything, the types and shadows of the Old Testament authenticate the New Testament. Likewise, the New Testament validates the Old Testament. Together, one can envisage a more complete picture of Jesus Christ. Trekking from Shreveport to Dallas and back to head up a homeless outreach under a bridge is a big undertaking for me. This was my first time driving the kitchen trailer by myself. I wasn’t dragging a three foot popup tent. It’s something around 37 feet of culinary carnage. Really, I anticipated that careening in slow motion off a bridge was in the realm of possibility, but I drove like an AARP racecar driver. The other concern came from my wife as I have a history of falling asleep at the wheel, and I had my oldest daughter and her best friend in tow. If I was feeding my candy crushing addiction and caused a fourteen car pileup because of my gross negligence, I don’t know how I could live with myself, but I think after community service, I could get back in my wife’s good graces. Catching my beauty rest at 75 mph with live cargo is a line my wife won’t cross. The other option was to go to sleep by 10 pm and guzzle about eight Red Bulls throughout the day. I thought aliens were going to burst out of my chest from this tonic, but it was a reasonable risk. We served shepherd’s pie and delightful bundt cake to around 200 homeless people under the bridge on Hickory Street. A church comes out regularly to preach the gospel to these people who may never have the opportunity. It’s a gospel of hope, and I hope the simple gift of a hot meal does its small part in sharing the love of Jesus Christ. Seventeen hours later, I’m on my couch reliving the day’s events. It is so amazing being to volunteer with fellow Mercy Chefs. It’s amazing to be trusted to move the kitchen to the site. It is just amazing serving Jesus Christ. I was engaged in an online conversation regarding the matter of homosexual ‘marriage.’ This is a matter in which many are involved. It is interesting to see how people today are quick to demonize anyone with a differing view. Tolerance is not holding the same view as everyone else. That is called agreement. In order to exercise tolerance, I must hold a view that is different than somebody else. No, I’m not evil if my views are not your views. In fact, if they were, that might make for some one-sided dialogue. I want to set the record straight that I do not believe homosexuality is an abomination. According to the Bible, God says homosexuality is an abomination. He says the same about lying and a litany of other transgressions. Do I think homosexuality is wrong? Absolutely. Do I believe that people should be able to conduct their lives as they see fit? Unquestionably. But I believe people deserve informed consent so that they may act accordingly. One issue I do have is the requisition of the term “marriage.” I believe as the Bible dictates. It says marriage is between one man and one woman. Though I disagree, I would be more comfortable with calling a homosexual union something else. The term ‘union’ would work nicely. As for me, it doesn’t matter what it is called as long as it is not marriage. I sincerely believe that marriage is a representation of the relationship between Jesus Christ (the Bridegroom) and the Church (the Bride). This is very sacred to me. So is my marriage to my wife of many years. If part of the issue pertains to affording homosexual couples the same benefits that married heterosexual couples enjoy, the laws need to be changed so that both groups are on equal ground. Another option is to strip benefits from heterosexual partners. A possible solution is this: the Church abandons the term ‘marriage’ in favor of a term that accurately defines the nature of the relationship in a God honoring way. Call it a covenantal union or something. I’m not terribly concerned over semantics. I just know that a heterosexual marriage is not the same as a homosexual ‘marriage.’ As much as we try to reshape our perceptions in the name of equality, it doesn’t change the fact that they aren’t equal. Sure, we can pass laws and we can aggressively prosecute Christians who don’t get with the program, but nothing is changed. A homosexual ‘marriage’ is not endorsed by God. Nor will He ever endorse it. I’m not saying this to be mean, but declaring something as true doesn’t make it so. Though a zebra looks similar to a horse, it still is a zebra. There was a time where I wouldn’t protest. Not because I thought it was the right thing to do. I just didn’t care. I also didn’t care about abortion or really anything else. I was an unregenerate who looked out for himself. I’m still a sinner, but I have repented of my previous life and put my trust in Jesus. I don’t want anyone to go to hell, but if someone lives an unrepentant lifestyle, the Bible is clear that hell will be his destination. Those are harsh words, and if I was in danger of hell, I would rather hear the truth now than find out when I’m standing in judgment. I’m sure it’s my turn to hear that I’m wrong. That is okay. Disagreement is not synonymous with hatred. It seems that people use the terms interchangeably. I hear people trying to enforce tolerance through intolerance. Maybe someone redefined ‘tolerance’ when I was sleeping, but to be tolerant of something, there must be some incongruity. If you like cheeseburgers and I don’t, as long as we don’t punch each other in the nose, we are being tolerant of each other. If I try to coerce you into forsaking cheeseburgers through litigation or other means, I’m being intolerant. I see the Tolerance/Intolerance Paradox in the world today. Some homosexuals demand tolerance while being intolerant of some Christians’ perceived intolerance. I can’t speak for everyone, but as for me, speaking against homosexuality (or whatever sin happens to be the flavor of the month) isn’t me trying to throw my weight around. I’m a wretched sinner like everyone else. I’m speaking out against the sin, not the sinner. I do so out of genuine concern for others’ salvation. I wish we didn’t live in a broken world. I’m compelled by my faith to warn of the real danger of sin. I do so out of love for my Savior, not out of hatred for my fellow man. I’ll have to admit that I have not been eating healthy due to the holidays. Face it, that is the time of year we are supposed to behave as if we were garbage disposals, consuming everything from roast turkey to whole pies. I’m surprised because I have actually lost some weight, but my cholesterol numbers are so horrific that my doctor has resorted to threats. I have always liked fish, but I rarely eat it. I have a number of reasons. First, beef beats fish. It’s like rock crushes scissors. No contest. Second, my kids are picky eaters. I’m the chef and they have vastly broadened their culinary horizons over the years, but fish happens to be their last bastion. Well, except for our five year old, Maddie. She is the most adventurous of the bunch. Strangely, green bean casserole happens to be her favorite dish and she is addicted to sardines. I also had my sardine fetish when I was her age. The reason I don’t eat sardines with as much voracity as I had in my youth is because my wife insists that I eat sardines outside. That doesn’t always happen. I have been known to eat sardine sandwiches in bed while she slept next to me. Okay, my reasons aren’t as numerous as I expected. Nevertheless, I have to actively work to incorporate tastiness in my kids’ lives. If it weren’t for me, I’m sure they would eat nothing but mechanically separated chicken nuggets. Blech. I was feeling lazy when I made this dish, so I looked back on how I prepared the fish previously. I developed a nice rub for blackening, but I couldn’t decide if I wanted to trim my rosemary bush and simply sear the fish. I had blackberries that I wanted to incorporate and didn’t think they would go well with the rosemary, so I decided to blacken this finned delight. I stuck with my blackening rub with a couple of changes, and I think it went well. 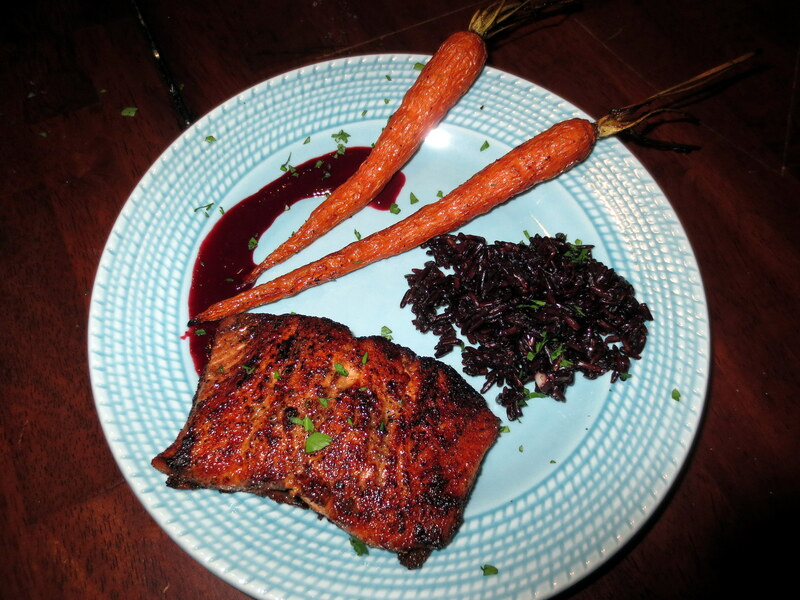 Coffee infused steelhead trout with roasted carrots, black rice pilaf prepared with clam juice, and a delicious blackberry sauce. Coat fish fillets liberally with EVOO. Apply rub liberally and allow to rest on butcher paper at room temperature for 30 minutes. Heat cast iron skillet. Once heated, add fillets flesh-side down and sear for three minutes (you may need to cook the fillets in a couple of batches). After three minutes, carefully turn and sear skin side for three minutes. When it is searing, don’t get impatient and fiddle with the fillets. You’ll end up with tore up fish. You’d be just as well eating a can of tuna if you do that. That’s it. The fish is done. The actually cooking part of the fish is the last thing you want to do as it cooks so quickly. This fish goes great with roasted carrots and black rice. If you really want to dazzle your spouse with culinary delights, make a nice blackberry sauce. Delicious. It is interesting to see the differences. KJV Today actually compares Luke 4:18-19 to Isaiah 61:1-2 from the LXX and from the KJV which is derived from the Masoretic Text. I assumed that both passages were identical. Once I looked at them together, I could see that there were significant differences. These differences serve as fodder for strict KJV adherents and I’m sure it stirs up great controversy among Bible nerds. What interests me is that Jesus quit reading from the scroll after he read, “to proclaim the year of the Lord’s favor.” He stopped at the comma, closed the scroll, and in Luke 4:21 Jesus said, “Today this Scripture has been fulfilled in your hearing.” Then the Jews in the synagogue tried to throw Jesus off a cliff. Jesus simply stopped at the comma as God’s day of vengeance is not yet upon us. The Day of the Lord (as it is known throughout the Bible) is the Day that He will pour His wrath out on the wicked. The day is coming where Jesus finishes the phrase and crushes the wicked. 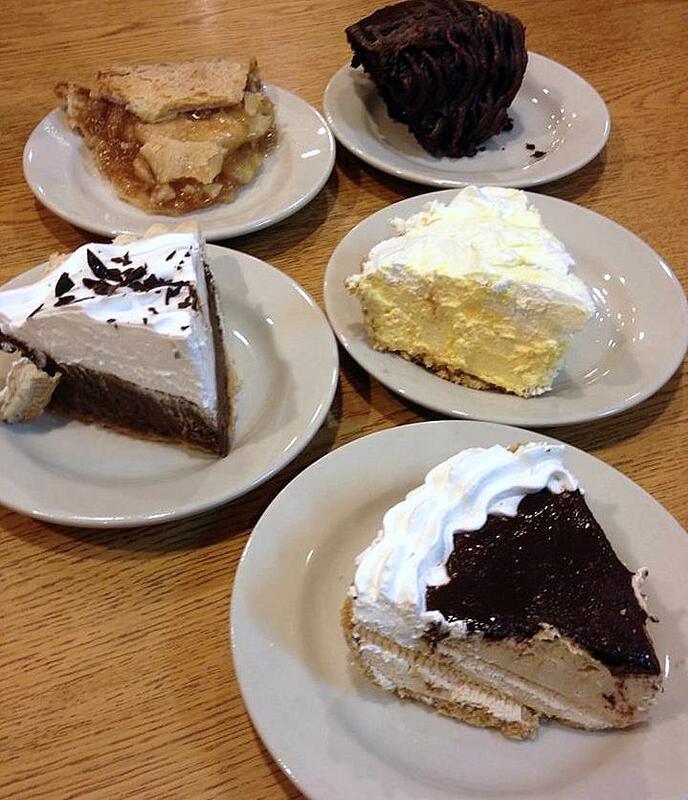 Whoever thinks that Strawn’s Eat Shop has the best pie in town has obviously been born without a palate. I was at Strawn’s recently and was saddened by the poor service and mediocre pie. We decided to have a pie date day as a family, so we went to Southfield Grill and all chose something different. That means I can sample more varieties. Zoe’ had the peanut butter pie. It was good, but I have had better. Alli’s apple pie was solid. If only it had a scoop of vanilla. Maddie ordered a chunk of chocolate cake. Very nice. Heather and I split the lemon and chocolate pies. The lemon pie is incredibly smooth and has a bright tartness. I’m pretty certain it gets that zing from lemon zest. By far, it is among the Hall of Greatest Pies. Now the chocolate is one that I haven’t had the pleasure of eating before today. It’s got to be scratch made with Hershey’s cocoa. It imbues an incredibly deep chocolate flavor complemented with whipped cream and chocolate shavings. Delicious pie. Normally, I’ll get a lemon pie for my birthday. I turn 40 this year so I may have to get a chocolate pie, too. I’m laying on the couch watching Morgan Spurlock’s Inside Man. There was this episode about Sunday Assembly, which is essentially an atheist church. I have heard about this type of church and I find it puzzling. Not only is an atheist church an oxymoron, I find that it is not much different than some churches today. Spurlock was in Nashville visiting churches so that he could glean some inspiration for his atheist message. For the record, I’m not particularly fond of churches using the term “message” in place of “sermon.” It sounds so sanitized and secularized. Nonetheless, I was interested to see that real worship services were used as inspiration for this brave new church. As I watched Spurlock’s reaction to hearing a sermon regarding marriage and homosexuality, I could see him mentally disengaging. I know that this topic made the cut to reinforce the notion that Christians are judgmental and intolerant. Not only that, the mere mention of God garners a subtle response that believers are bonkers. I can live with that but I still find it peculiar for someone to look to the church to model an atheist church. Many churches today perform contemporary Christo-pop songs quite badly and on this episode of Inside Man the secret of Sunday Assembly is revealed–badly played Bon Jovi and 80’s hair music and ego puffery. If you look at Joel Osteen, you get an unbiblical feel good message sanitized of the real Christ. Atheist church has its own brand of positive sentimentalism. It is actually alarming to see that many churches today are virtually indistinguishable from this new godless church movement. I don’t see the point. To meet simply for community seems ridiculous to me. I know different people have different motivations for attending church. As for me, I’m going to worship Jesus. Everything else pales in comparison. I have numerous friends at church, but I don’t get up Sunday mornings to hang out with my buddies. I go to worship Jesus. Maybe I’m just antisocial. Growing up I often found myself often excluded on the playground. Today I carry my phone everywhere and I get irritated if it rings. I sometimes get put out if I get a text. It keeps interrupting my candy crushing efforts. What I’m trying to say is that meeting up with a bunch of people I may or may not know doesn’t feel much like community to me. I’d rather pile into the van with family and friends to feed the homeless instead of having some life coach facilitator telling me and the rest of the strangers that I can feel loved and included. It’s vacuous and empty without Christ. It is an exercise in self-importance. I don’t have a problem with atheists meeting up for their godless church therapy sessions. I just find it pointless. If we really are just living to die, why waste it on some contrived sense of community? Are we really this disjointed as a society that we have to create a cheering section for our egos? If there is nothing after I die, my time is best spent as an epicurean. If this is it, why waste time when I can fulfill my desires and numb my senses? Then again, how much different are some of today’s churches from Sunday Assembly? Not much.